A college basketball program relies on more than just the players it puts on the court. The Maryland men make only their second trip to Baltimore in 19 years Dec. 8, when they meet Loyola University Chicago at Royal Farms Arena. Sister of Charity of the Blessed Virgin Mary Jean Dolores Schmidt, the 99-year-old chaplain who added to the charm of the Ramblers’ run to last season’s Final Four, doesn’t travel in the regular season, but the high school coach responsible for developing 40 percent of the Terps’ starting lineup will be in the house. 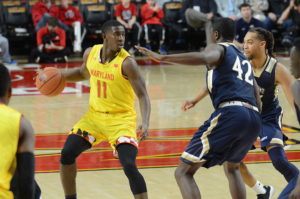 Jalen Smith, a 6-foot-10-inch freshman and two-time Baltimore Catholic League Player of the Year, averaged 12.6 points and 7.3 rebounds for the Terps during a 7-1 start. Their wings include sophomore Darryl Morsell, the MVP of the 2017 BCL tournament. Both developed at Mount St. Joseph High School under Pat Clatchey, who’s is in his 27th season as the Gaels’ varsity coach. Before he took over at his alma mater, it had never won a BCL championship. 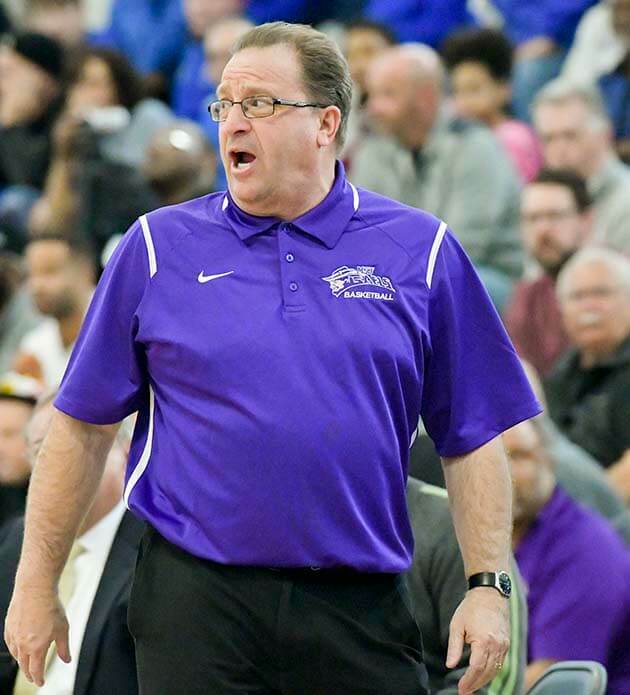 Mount St. Joseph, however, won seven of the 15 BCL tournaments from 2003 to 2017, making Clatchey the first coach in league history with that many tournament titles. Morsell and Smith, who carried a 3.6 GPA at Mount St. Joseph and is majoring in information science in College Park, fit that description. 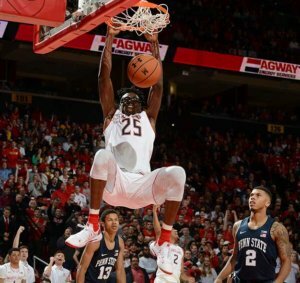 Terp fans know to enjoy Smith while they can, as he is projected to go high in the first round of the 2019 NBA draft. He figures to be Clatchey’s third NBA player, behind Henry Sims (class of 2008) and Jaylen Adams (’14), a rookie with the Atlanta Hawks. Sims starred at Georgetown, Adams at St. Bonaventure. Phil Booth, a two-time BCL tournament MVP for the Gaels, is a fifth-year senior at Villanova, where he’s already played on two NCAA championship teams, in 2016 and ’18, and is a Big East Conference all-academic selection to boot. “It’s no coincidence that our (graduates) are playing for and learning at prominent Catholic universities,” said George Andrews, president of Mount St. Joseph. “Not only is Pat producing good basketball players, (they) represent the shared values of Catholic education at Mount St. Joseph and these universities. That legacy includes Eric Atkins (’10), who started 105 games for the University of Notre Dame and is now the video coordinator for the Fighting Irish. Clatchey, Atkins said, did more than teach him the “little intricacies” of playing point guard. “Pat let me make mistakes, a huge reason for my success,” Atkins told the Review. “He didn’t pull me out when that happened, but helped me through it. He gave me the ball as a freshman to run the varsity. I wasn’t sure if I was ready, but it sped my development. Last March, Loyola Chicago became the fourth No. 11 seed to reach the Final Four. The second was George Mason in 2006, when the Patriots’ leader was Will Thomas, a sophomore forward who was two years removed from Mount St. Joseph, where he famously frustrated Archbishop Spalding and Rudy Gay, now in his 13th season in the NBA. Clatchey does not abide the parental histrionics that detract from youth athletics, preferring to recruit boys from stable families who do not complain about officiating, let alone coaches. He grew up in St. Benedict Parish in southwest Baltimore, and began his education at its parish school. Richard and Virginia Clatchey, his parents, also happened to be members of the Order of the Alhambra, a Catholic fraternal organization that since 1961 has hosted a postseason tournament in Allegany County for Catholic high schools. His peers on a Gwynn Falls Park playground included the late Quintin Dailey, who starred for the former Cardinal Gibbons High. Clatchey played interscholastically for Mount St. Joseph as a freshmen and sophomore, but recognized that his future in the game was in coaching. He was coaching the Gaels’ freshman team as a 20-year-old; was on the staff at UMBC in the late 1980s; had a brief stint as a pro scout; and then returned to Mount St. Joseph in 1992 as its varsity coach. He was 29, and the new kid on a BCL block filled with legendary coaches, all now retired, a few deceased. He also nods in the direction of Morgan Wootten, the DeMatha Catholic High coach who is a member of the Naismith Basketball Hall of Fame. Wootten recommended Clatchey to coach in the 2009 McDonald’s All-American game. At the time, Clatchey was teaching physical education at Our Lady of Victory School in Arbutus. It wasn’t until four years ago that he went to work full-time at Mount St. Joseph, in its DePaul program. The school’s commitment includes a new gym that opened five years ago in the Smith Center. Clatchey’s personal blessings begin with his wife, Melanie, “who has allowed me to do this for so long,” and sons Clark (’15) and Connor (’19), fellow Mount St. Joseph alums. The family worships at St. Mark in Catonsville. Clatchey’s record includes 658 varsity wins and more than 40 players going on to Division I basketball. The Gaels hope to challenge defending BCL champion St. Frances Academy with a rotation that includes freshman Antonio Hamlin, sophomore Ausar Crawley, and Jevonte Brown, a 6-11 junior from Toronto who Clatchey said is the Gaels’ first upper class transfer in over a decade. Their top scorer is senior guard James Bishop, who has accepted a scholarship to attend Louisiana State University. 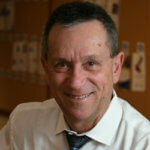 Paul McMullen has served as the managing editor of the Catholic Review since 2008. The author of two books, Paul has been involved in local media since age 12, when he began delivering The News American to 80 homes in his neighborhood. He began his journalism career with the Capital-Gazette Newspapers in Anne Arundel County, and spent more than 25 years as a sports writer for The Sun in Baltimore. His favorite writing assignments have included the Summer Olympics in Australia and Greece, the Archdiocese of Baltimore’s response to the 2010 earthquake in Haiti, and “Feet for Francis,” a 2015 walking pilgrimage from the Baltimore Basilica to Philadelphia to see Pope Francis.